From the beginning Ascension Church has been remarkable for the “can do” spirit of its parishioners. The history of the church generally dated from 1855, with the first celebration of the Holy Eucharist in that year. No church building existed, however, until 1858 when a lot across from the courthouse was purchased. The congregation renovated a small pre-existing building for use as both a school and a church. 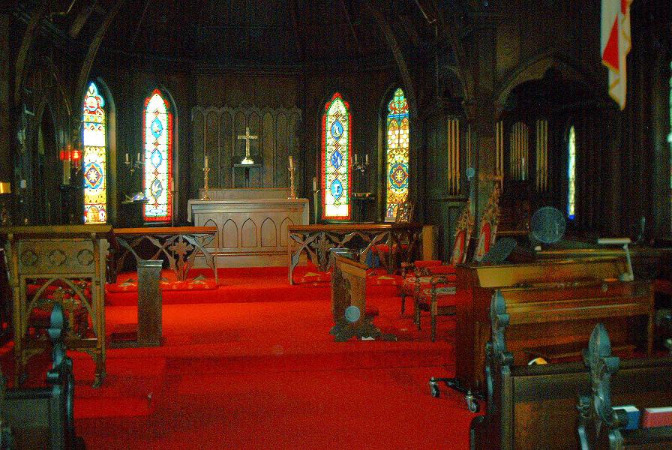 This suffered extensive damage during the Civil War and the parish did not recover for 12 years. In that time the original building was completely destroyed by fire. The church was reduced to meeting "above a nest of barrooms" according to one former rector. Undaunted by their misfortune, the people of Ascension began to rebuild. The present building dates from 1878 and is the oldest church building still in use in Mount Sterling. It was consecrated by the Rt. Rev. Thomas Underwood Dudley, second bishop of Kentucky, in 1882. In the 1950’s the congregation continued in their “doing it ourselves” tradition. The prayer garden and the brick wall surrounding it were built in 1953 under the supervision of Mrs. Florence Hargrave. The garden was constructed of brick salvaged from a disused well. More recently a new parish hall (Lloyd-Green Hall) was constructed. Once again Ascension called on local talent by appointing Mr. Chenault Woodford the architect for the project. The new building which houses offices and education space as well as a kitchen and dining hall, was consecrated in March of 1992. In 1995 the old undercroft parish hall was remodeled to accommodate a meeting room and choir facilities designed by the Rev. John Dews. The Church of the Ascension looks forward to the next century and a half with the same spirit of resolve and enterprise that began this adventure in 1855.